The Dutch “Golden Age” is having a celebrity moment—its artists feature in movies, novels and popular biographies; its artworks appear on tote bags, throw pillows and iPhone cases. These 400-year-old artifacts have proved smoothly adaptable to contemporary consumer desires, but the actual lives behind them—the thoughts, motives and technologies of the people who made them—seem ever more inaccessible (or perhaps, from the marketing angle, irrelevant). The Fine Arts Museums of San Francisco’s exhibition and catalogue “Rembrandt’s Century” attempt an ambitious thing: exploiting the generic popularity of the Golden Age to present a subtle and thoughtful investigation of the intentions, materials, logistics and belief systems that built one of the most magically productive moments in the history of art, and doing so through hundreds of works on paper, primarily prints. Rembrandt van Rijn, The Landscape with the Three Trees (1643), etching, drypoint, and engraving, 21.3 × 27.8 cm. Collection of Marie and George Hecksher. ©Fine Arts Museums of San Francisco. Although several of the museum’s most famous works—Vermeer’s great View of Delft, Rembrandt’s shocking Anatomy Lesson of Dr. Tulp, Paulus Potter’s endlessly popular, sloe-eyed Young Bull—stayed behind in The Hague, the traveling show includes Carel Fabritius’ magical goldfinch (1654), Jacob van Ruisdael’s splendid view of bleaching fields on the edge of Haarlem (1660) as well as Frans Hals portraits, Pieter Claesz still lifes, rambunctious Jan Steens and a slew of other great paintings. This is tough material to compete with, especially, one might think, for small, black-and-white, linear images behind glass. But those 35 paintings are a lure to a certain world—the world lovingly detailed by its brush-wielding inhabitants in all its glimmering, sidelit glory—and viewers are likely to leave the Mauritshuis show wanting more. The easy thing would have been to tack on a single room of some name-brand etchings to breeze past on the way to the gift shop; instead the museum seized the opportunity to present a show as grand and time-consuming as the painting show next door. As any curator knows, historical prints take time to reveal themselves, particularly to audiences used to bright color, large scale and, increasingly, to things that move. It is a sign of both the quality of the art and the clever engineering of the presentation that the galleries were packed with visitors walking slowly and looking carefully. It is a big show, but laid out as a series of small spaces with a handful of prints in each so that from the point of entry it seems quite manageable. By the time the scale of the endeavor is evident, the viewer is hooked. The focus of the show is not Rembrandt’s biography, but rather the way 17th-century prints—of which his are the preeminent example—functioned to disseminate ideas, discoveries and styles. In the museum, this sets up a graceful complementary relationship with the Mauritshuis show; in the catalogue, it provides a fluid structure for moving between broad cultural observations and the concrete facts of the objects at hand. 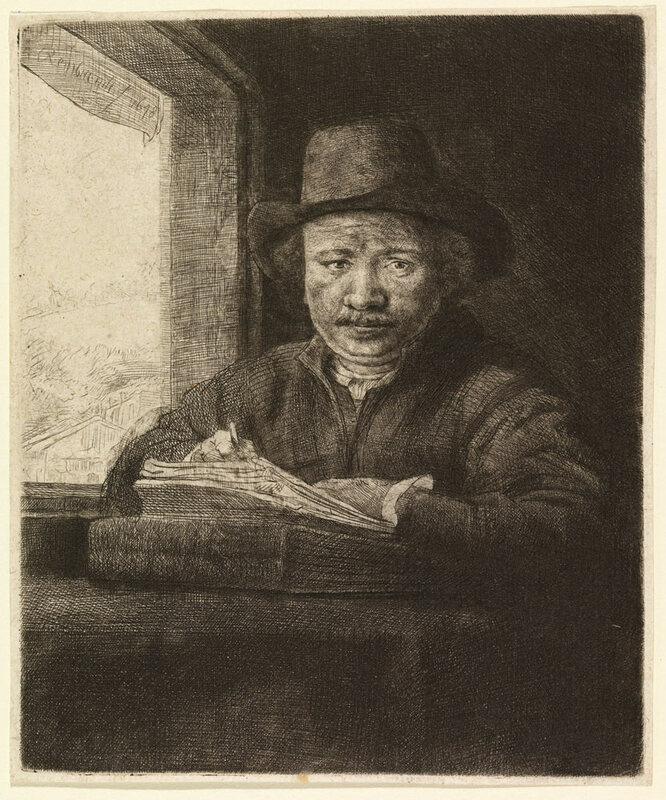 Rembrandt van Rijn, Self-Portrait Drawing at a Window (1648), etching, drypoint, and engraving, 15.7 × 12.9 cm. Bruno and Sadie Adriani Collection, 1959.40.19. ©Fine Arts Museums of San Francisco. The 251 works are grouped in astute and sometimes surprising ways: portraiture is one category, self-depiction by artists is another. This actually makes good sense: 17th-century portraiture was largely a field of pomp, circumstance and profitability, as is made clear by a pair of mezzotints that initially appear to be mirror images of each other, though one depicts the wood carver Grinling Gibbons and the other the painter Pieter van der Plass. With audiences of the time, van Dyck’s formal and occasionally soulless portraiture engraving was a far more popular prototype than the intimate vulnerability of Rembrandt etchings. Self-depiction, by contrast, was a far more inventive game than portraiture. Ganz begins his chapter “The Artist is Present” with Hendrick Goltzius’ The Circumcision (1594), a crowd scene into which the artist sneaked his own visage, the eyes above the natty beard fixed firmly on the viewer. In the century that followed Goltzius’ engraving, the presence of the artist was asserted through innovations in style and subject matter as much as through overt self-portraiture—the act of depicting became the subject of depicting (there is a bevy of pictures of people drawing), and in works like Rembrandt’s purposely half-finished etching The Artist Drawing from a Model (1639), process is left boldly exposed. The tension between the demands of conventional prototypes and the delights of rendering the visible world is quickly established in these first two sections, as is the distance between what we, as dwellers in the 21st century, value in these pictures and what the artists who made them had in mind. 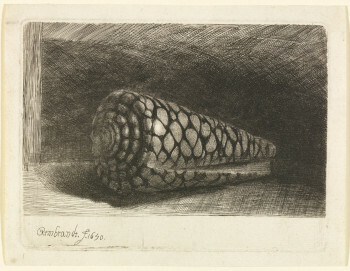 The third section takes as its mascot Rembrandt’s 1650 etching of a marbled cone shell, the only still life among his hundreds of prints. He presents this object in all its seductive material particulars—its scale, its pattern (though the swirl is reversed in printing), the way it sits on a surface—but typically stages it, emerging from darkness with melodramatic panache. 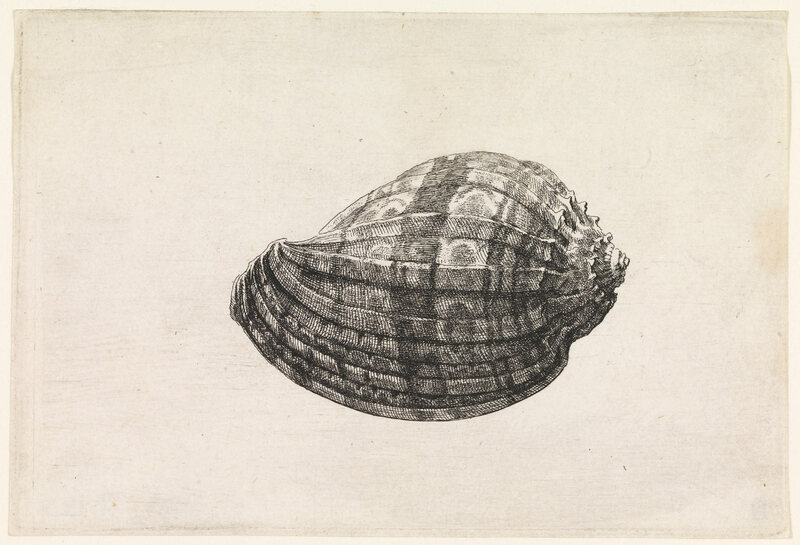 Wenceslaus Hollar’s shells, on the other hand, are specimens free-floating on the white page, objects of study divorced from the dramas of the world. The end of this trajectory can been seen in the spectacular foothigh ant engraved after Robert Hooke’s microscope studies. Early natural history illustrations like these seem to embody a 17th-century edge-of-the-Enlightenment moment when close observation was the driving force of knowledge and discovery in both art and science. 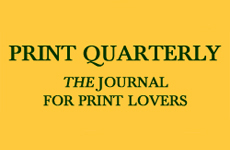 Prints were a critical—perhaps the critical—element in the visual codification and transmission of science [see the review of Prints in the Pursuit of Knowledge in Early Modern Europe in Art in Print, Vol. 2, No. 4].2 The look of printed imagery became the look of knowledge, much as 1960s printerly syntax embodied the look of commerce for Pop artists. Jan van Kessel II and Johannes Bronkhorst made beautiful paintings, included here, in imitation of natural history prints. Rembrandt van Rijn, The Shell (Conus Marmoreus) (1650), etching, drypoint, and engraving, 9.7 × 13.2 cm. Museum purchase, gift of Dr. T. Edward and Tullah Hanley by exchange, Achenbach Foundation for Graphic Arts Endowment Fund and Anonymous Bequest, 1997.42. ©Fine Arts Museums of San Francisco. Wenceslaus Hollar, Shell: Major Harp (Harpa major), from a series of shells (ca. 1646), etching, 9.3 × 14.1 cm. Museum purchase, Achenbach Foundation for Graphic Arts Endowment Fund 1992.3. ©Fine Arts Museums of San Francisco. Such images are instantly appealing: beautiful and smart, conceptual and tied to the material world, suggestive of a curiosity, abstraction and desire we can relate to. But that is only part of the story. They also document the startling cosmopolitanism of 17th-century Amsterdam. The sea snail that provided the shell for Rembrandt’s etching lived and died in the Indian Ocean. Rembrandt printed on papers handmade in Japan; he made drawings modeled on Mughal and Deccani miniatures that he may well have owned. Rembrandt’s shell is “nature,” but it is also wealth. And wealth—like beauty—was not an unalloyed good. The various components of the Still Life with Skull, Pocket Watch and Roses by Jean Morin after Philippe de Champaigne are beautifully depicted objects, but they are also sententious props, dour reminders that life is fleeting and death awaits us all. Jacob and Joris Hoefnagel’s engravings of insects, flowers, rodents and vegetation are easy for contemporary viewers to love since most of us cannot read the Latin inscriptions: “Gather, girl, the roses, while spring is new and our youth is fresh, and be mindful how your life rushes by,” advises one sheet of peapods, lilies, mosquitos and caterpillars. 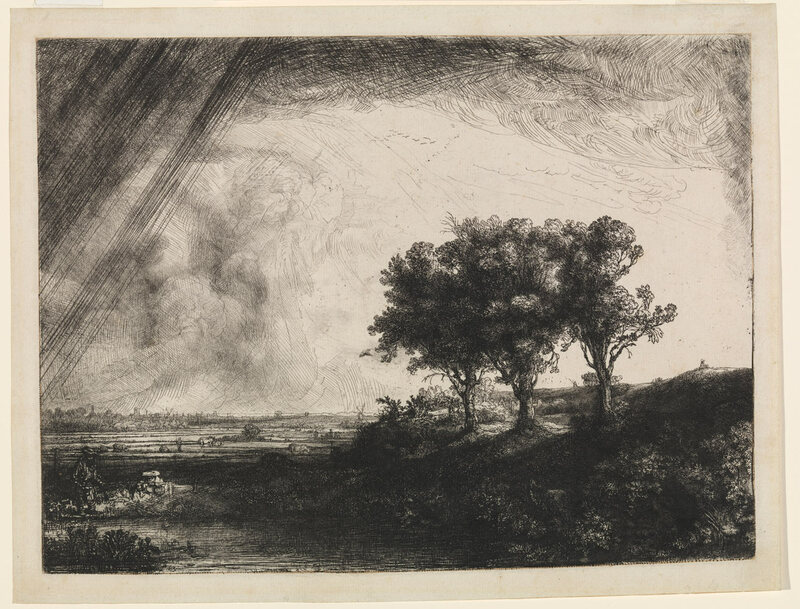 Despite the vast scholarship devoted to this print, it remains one of Rembrandt’s most fundamentally elusive creations … While persuasive in its naturalism, attempts to pinpoint its actual site—and even the species of its trees—have proven inconclusive. And while the three trees are potentially rich symbols of both the Holy Trinity and the Three Crosses of Calvary, there is no proof that the artist saw them—or intended them—that way. The dramatic chiaroscuro is softened by the many subtle areas of velvety drypoint burr—the tiny bits of copper that form a ridge along the incised lines and catch ink—and retroussage, the use of a muslin to coax ink out of the etched and incised lines. Works like this one helped establish an alternate set of criteria for print connoisseurs, for whom the aesthetic of the blur would come to be prized over the sharp line. In graphic terms, Rembrandt’s dark-manner etchings marked the ultimate triumph of the irrational over the rational. 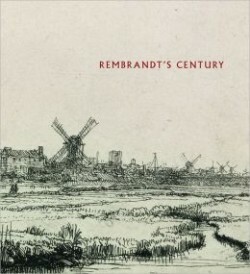 “Rembrandt’s Century” is a large show but a modestly sized book; the entire volume can be read with ease in an afternoon. 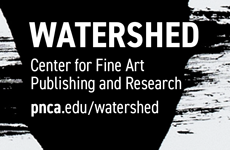 It is not loaded with new, groundbreaking research, but as an introduction to one of the densest arenas of art historical scholarship, it is nimble, subtle and beautifully produced. As with a Rembrandt etching, a world of meaning is packed within. 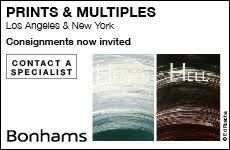 , The Fine Arts Museums of San Francisco.